We “lost” our TOAD (the Jeep we tow) signal lights shortly after we had our engine overhaul in Superior, WI. So for several days we were driving around illegally. Bad mojo. We tried to get it fixed at a Cummins/Spartan shop in Fargo, but after 3 hours the techs couldn’t locate the problem, and we weren’t about to give them carte blanche at $118 per hour. I didn’t want to try fixing something professionals couldn’t remedy. But what about installing another TOAD lighting system? 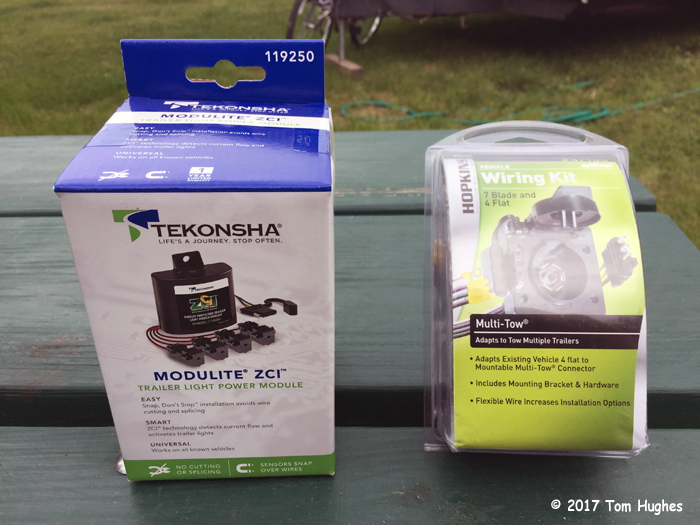 After searching online RV forums and lots of Googling, I thought I found a solution — Tekonsha ZCI System for about $124. I looked at a Hopkins system, but to use it I would have to “cut” into the RV’s wiring. The Tekonsha system is described as a Zero Contact Interface (ZCI) which means there is no cutting. 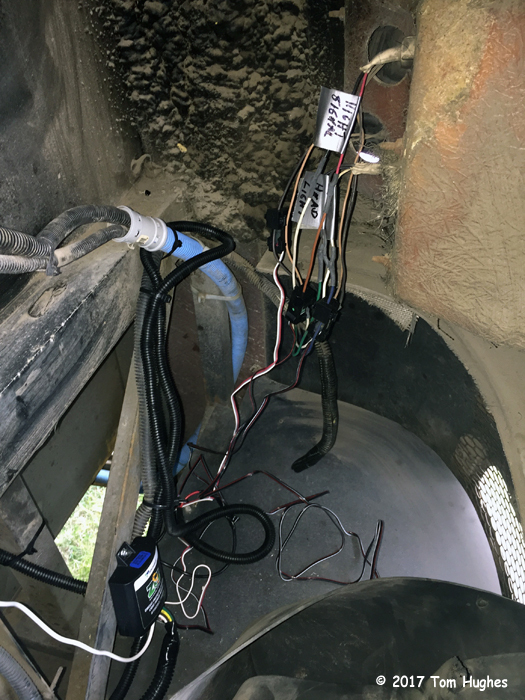 The Tekonsha system uses induction — each light sensor wraps around a wire (for example the brake wire). 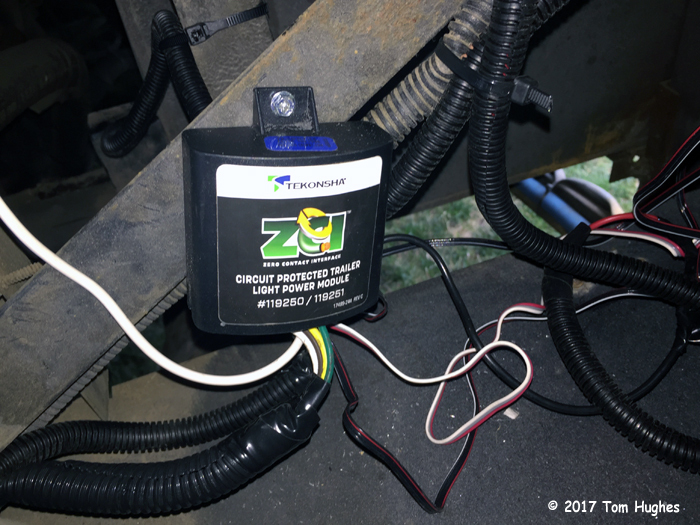 When the wire is energized, the Tekonsha system converts it to a voltage. It sounded too good and too easy to be true, but we were desperate. 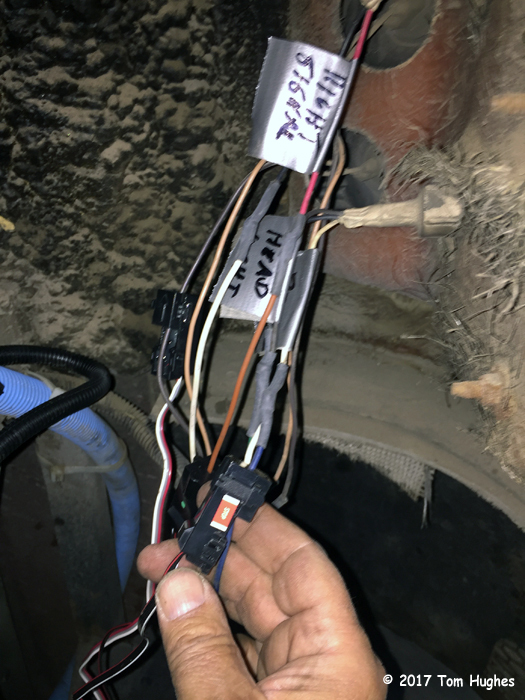 We needed a TOAD lighting fix right away, and I loved the idea of not cutting into our RV’s wiring. Here’s my Tekonsha installation story . 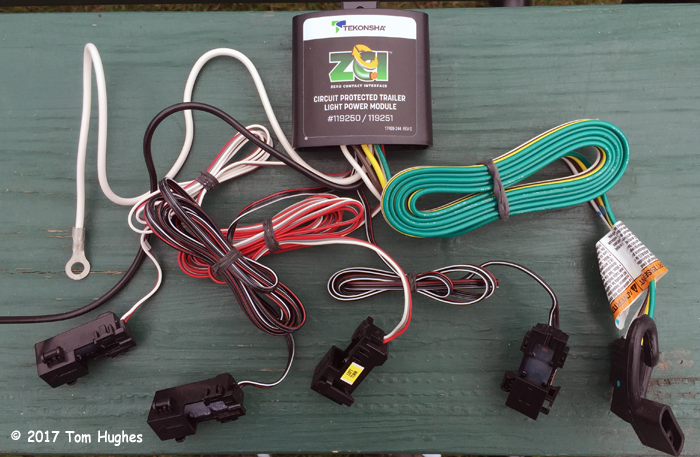 . .
3-wire system: The vehicle’s turn, brake and tail light function are on separate wires. 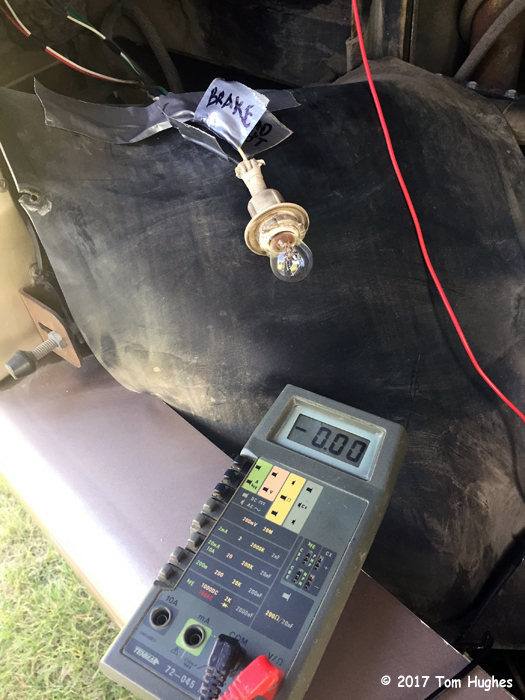 After finding out each the function of each tail light, I identified the wire that powered each bulb. To do this, I exposed part of each wire and then connected the wire to a multimeter. So far so good. 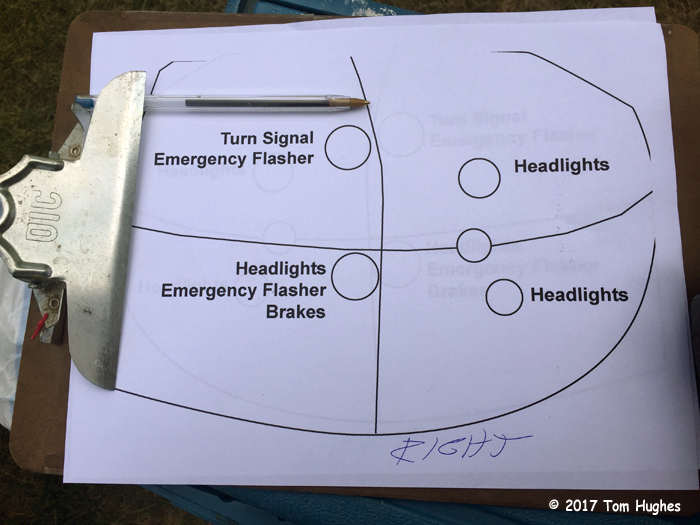 I was able to identify the wires for the left and right turn signals, the brakes, and headlights (taillights). 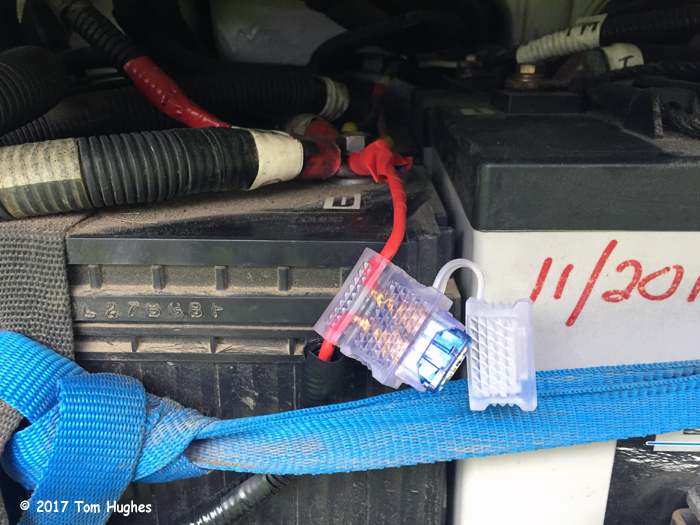 The Tekonsha system must be connected to a permanent 12V power source — that is, directly to the RV’s engine battery. 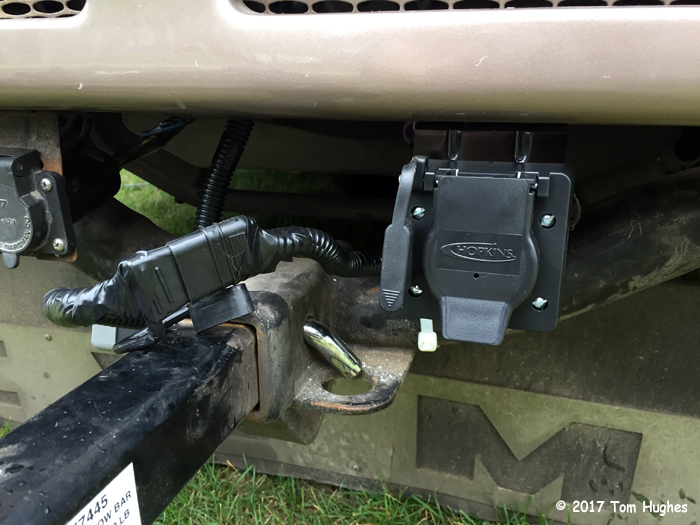 The hardest part about this was routing the power wire from our RV’s pullout battery compartment up into the back of the RV. The power wire uses a 15A fuse which alse serves as an installation “switch”. When you first activate the Tekonsha system by inserting the 15A fuse, the system must be “taught” or sync’d. To do this you just flash the left turn signal 5 seconds, the right turn signal 5 seconds, and so on. Not a big deal. However, if the Tekonsha system is disconnected from its power source, you’ll have to re-sync the system. Truly, the easiest part of the install. You just need about a 3-inch length of wire for each sensor to clip onto. Way to solve this problem Tom! Wow.. after all that hard work, effort, research, etc. One really wanted things to work out.. and it did.. Great Job Tom! !